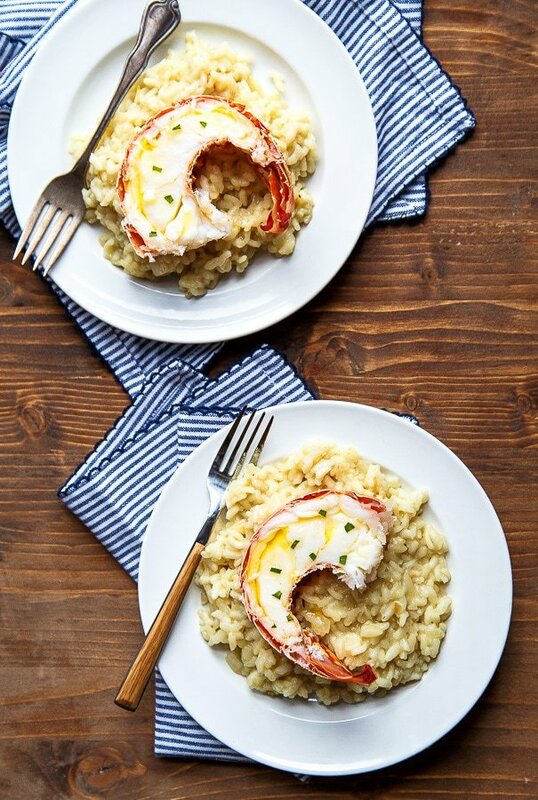 Lobster risotto for two–creamy brown butter risotto with a split lobster tail on top. Such a romantic dinner for two idea! Anyway, I’ve seen some pretty great prices on frozen lobster tails in the markets lately, and I think they make this dish really appraochable. Approachable in terms of price, and in terms of ease: there ain’t no way I’m killin’ something in my kitchen, so a frozen tail is the only way it works for me. If you can buy the whole lobster and use the rest of it for stock, more power to you! Thanks to you guys letting me partner with brands, this month’s shipment from Omaha Steaks for recipe development purposes contained frozen lobster tails ready-to-cook. It was a happy day, indeed! Whenever I come across such a pretty cut of meat, I try to prepare it in the simplest way possible. In this case, I defrosted the tails, lightly steamed them, and then drowned them in butter. Then, I made a simple risotto to serve underneath that complimented the butteriness of the lobster with more butter. Yep. Risotto is a great vehicle for butter and bed for any cut of meat. If you’re not up for lobster, top this risotto with shrimp, instead. I hope y’all are enjoying more Dinners for Two on the site lately. If you have any requests, please, let me know. I’d love to work on it for you! In a 2-quart saucepan, bring about 6 cups of water to a simmer. Add 2 tsp salt to the water, and then add the lobster tails. Adjust the heat to maintain a constant simmer (never a boil) and cook the lobsters for 8-9 minutes. Before removing from the water, ensure the meat is tender by poking it all the way through in several places with a toothpick. (Move the shell apart slightly to do this). Use sharp kitchen shears to split each lobster tail in two. Use two forks to gently pry the meat away from the shell. You can serve it in the shell, or remove the meat and dice for stirring into the risotto, your choice. Meanwhile, in a heavy saucepan, add the olive oil and 1 T of the butter. Turn the heat to medium and let the butter melt. When it starts sizzling, add the onions or shallots. Cook until soft and translucent, about 3 minutes. Next, stir the rice into the onions. Cook for 5 minutes while stirring occasionally. Before moving to the next step, ensure that the edges of the rice are starting to turn translucent. Stir in the wine and salt, and cook while stirring continuously until it evaporates almost entirely. Begin adding the chicken broth, 1/2 a cup at a time and continuously stir until it almost entirely evaporates. (It should take about 15-20 minutes). When youâ? ?re down to the last 1/2 cup of chicken broth, taste the rice and see if itâ? ?s al dente. When the rice is done, turn off the heat and add 1 T of butter. Stir until it melts. Melt the remaining 1 T of butter and have ready for topping. 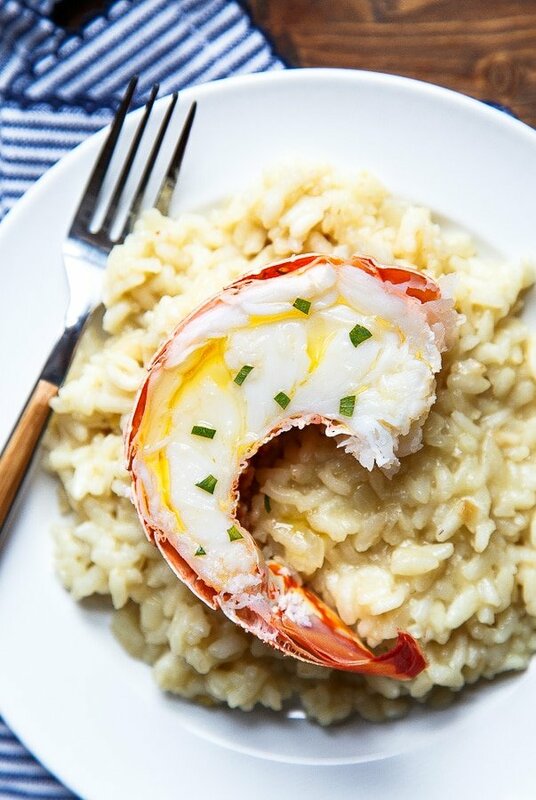 Divide the risotto between two plates, top each with a lobster tail, and drizzle the melted butter on top of the lobster. As you know, I partner with Omaha Steaks each month to produce one fabulous dinner for two recipe. This month I used their lobster tails when testing this recipe. I was compensated for my time and received the products for free. Thank you for letting me work with brands that I love! So classy! I’ll take these plates, with some candlelight. Oh, and my stretchy pants, because I kind of want both servings. OK? Mmmm nothing better than going out with a bang on Good Friday! Keep the dinners for two coming! I want a giant bowl of this! I’m sitting here seriously drooling over the look of that lobster tail. So good! It looks fantastic! I’ve never made risotto but that needs to change! I love risotto and then you went and added lobster. Delish! So pretty!! And it’s making me crave risotto, which I somehow seem to forget about all the time. Looks good! Lobstah and butter is a combo that will never fail. Mmmm! When I was pregnant I really didn’t have a taste for meat or seafood of any kind. Like you said, I ate it every now and again because of the giant human in my belly. Live lobsters scare the crap out of me. Ain’t no place for them here!!! I gave up all meat and seafood one year during lent and then we had lamb Easter Sunday. Not the best protein to cut your teeth on after not having any for so long! This lobster looks awesome btw. I have a request: can I come over for dinner? Dinner for three?? This looks heavenly! What a gorgeous dinner! You always knock it out of the park lady! This risotto looks so fabulous and the lobster is an elegant touch that I know my family would love. I better check on those prices at the grocery store stat! I saw this on Instagram and made it tonight for date night. It was my first time making risotto and it was easy to make and turned out fantastic! Both my husband and I loved what a comfort food it was and the lobster was an excellent touch. We both say this is a keeper! I keep telling myself I must stop licking the screen…but I just can’t stop!!!! What a delicious and simple meal! Thanks for reminding me to keep it simple sometimes! ya….. we talked about this on Facebook…. lobster and me…… lol….. This looks like such a delicious and decadent meal! LOVE!!! This looks so classy and elegant. It will definitely bring out a good aura for dinner. Very lovely meal! Oh my goodness this lobster risotto sounds amazing! Just looking at that lobster is making my mouth water! I MUST have some! This reminds me that I haven’t made risotto in AGES!! 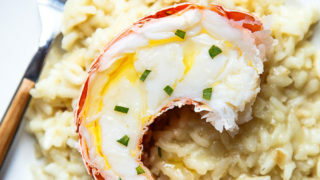 I usually make mushroom risotto, but lobster risotto sounds like my kind of dish! So decadent, and a meal in itself. Okay, I was the Lindsay that commented before. I did this for my husband and son tonight. I used shrimp and crumbled bacon instead of lobster. My son said that he wished the whole pot could fit in his mouth because he loved it so much. This is a new family favorite!